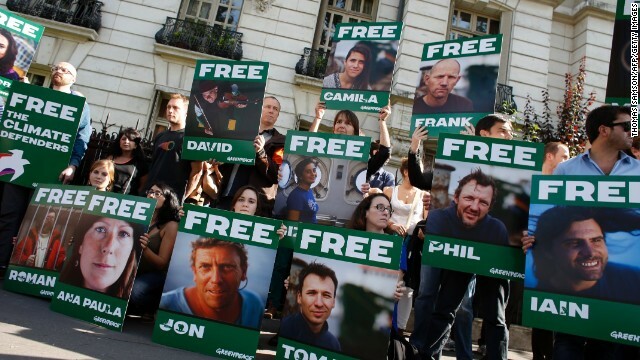 Greenpeace activists protest on September 27 in front of the Russian embassy in Paris. Greenpeace says Russian claim "is a smear, it's a fabrication, pure and simple"
Moscow (CNN) -- Russian investigators said Wednesday they had found narcotics on a Greenpeace ship whose crew was detained in the Arctic last month -- an allegation quickly disputed by Greenpeace as a smear. Some of the 30 people who were aboard the icebreaker Arctic Sunrise are likely to face additional charges, the Russian Investigative Committee said. Authorities say they think the narcotics include opium. The 28 Greenpeace activists and two journalists who were arrested on the ship as they protested Arctic drilling already face piracy charges. All 30 pleaded not guilty in court last week. The Investigative Committee said Russian experts were looking into the "origin and purpose" of the drugs seized, which it described as "presumably opium straw and morphine." Greenpeace said the claim that Russian authorities had found drugs on the vessel "is a smear, it's a fabrication, pure and simple." "We assume this announcement is designed to deflect attention from the growing global outrage over the continued imprisonment of the detainees," it said in a written statement. The environmental campaign group has repeatedly condemned the detention of its activists, saying they were taking part in a peaceful protest against the "slow but unrelenting destruction of the Arctic." 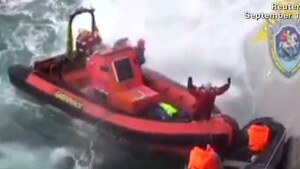 Russian authorities made the arrests after two of the activists left the Arctic Sunrise and tried to climb the side of an oil platform owned by the Russian energy giant Gazprom in the Barents Sea. The government in the Netherlands -- where the Arctic Sunrise is registered -- wrote to the Dutch parliament Friday to say it has launched legal action aimed at freeing the 30 under the U.N. Convention of the Law of the Sea. Two of those detained are Dutch citizens. The defendants also include Americans Peter Wilcox, who is the captain of the Arctic Sunrise, and Dmitry Litvinov, who Greenpeace says also holds Swedish citizenship. If convicted, they could be sentenced to up to 15 years in prison. Lawyers acting on Greenpeace's behalf have filed appeals in court seeking the defendants' release, Greenpeace said. Russian authorities accuse the defendants of trying to commandeer the platform. The authorities and Gazprom also say that the activists endangered the lives of the company's employees and that their action could have led to an environmental disaster. CNN's Alla Eshchenko reported from Moscow and Laura Smith-Spark wrote in London. CNN's Ross Levitt contributed to this report.